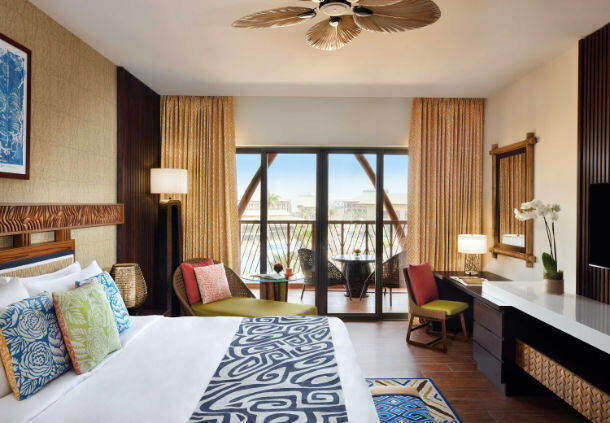 LaPita Hotel & Resort - a family paradise - The Source Online M.E. Not sure how to keep the kids entertained over the coming break? We have you covered. Less than 2 hours drive from Al Ain on the Jebel Ali Rd lies Dubai Parks and Resorts. A combination of theme parks, F&B outlets, stores and home to the Polynesian inspired La Pita hotel and resort. Ideally situated within walking distance to the entrance of Riverland (the F&B area located along the old world canals and authentic looking village buildings), La Pita makes it easy to come and go from the parks while being able to relax in comfort after a hard day of rides and fun. It was raining when we arrived so instead of hitting the pool (and lazy river situated inside the hotel pool area itself), we opted for The Lapita Daycation Brunch. What a feast for the senses. We were welcomed with a warm smile and friendly greeting of “Aloha” before having a garland of flowers placed around our necks in true Polynesian style. The décor and ambiance of the entire property make it truly feel like you are on a tropical island in the South Pacific. The brunch is an ideal way for families to get the most out of the visit as it includes pool access for the afternoon after you have had your fill of what can only be described as a mindblowing array of delicious delicacies. Something for everyone, the offerings include lobster to roast lamb and everything in between – not to mention the interestingly named “salmon poke” station. There is also a special kids station where young ones can get more familiar offerings like burgers, fries, pizza, and crudité vegetables. The Multi-colored candyfloss was a big hit with my daughter who took great delight trying out different colors. We opted for the soft drink package which comes with a range of delicious non-alcoholic cocktails – I can definitely recommend the Coco Mojito made with mint. For parents looking for a bit of peace and quiet – there is a kids area set up on the stage at the front of the restaurant so you can keep an eye on your little darlings while hotel staff keep them entertained with games, balloon animals and activities to allow you time to really tuck into that pile of grilled shrimp that I know you can’t wait to have. Another highlight is the kids club (I would say more suited to kids below 10 years for activities). The staff make a real effort to keep it fun and entertaining making sure that everyone feels included. For older kids, there are a few arcade games and of course –PlayStation! The pool area is divided into 2 distinct areas. One for smaller kids and one for adults and kids that can swim. Not your normal mini kiddie pool – La Pita boasts a huge wet / pool area so families can really enjoy themselves. The lazy river creates that extra special touch that puts La Pita ahead of the pack. The adult pool is next to the bar allowing for a more social experience. Rooms are housed in individual blocks on the property. On arrival, you are given a map with your building marked on it. We opted not to take the waiting golf buggy and instead set out on foot with the youngest family member in charge of navigation. Rooms are equipped with all the amenities you would expect, but extras like being able to pair your electronic device to the TV really make it a home away from home. Luxurious beds and a rain shower that makes you never want to leave, parents will certainly feel the stress melt away once they are snuggled up under the thick plush duvet with crisp fresh sheets.